F. Ball’s ‘System LVT’ range comprises a carefully selected portfolio of products the company recommends using in combination for optimum results when installing luxury vinyl tiles. The range comprises Stopgap 300 HD floor levelling compound, Styccobond F46 pressure sensitive acrylic adhesive and Stopgap P131 general purpose primer. 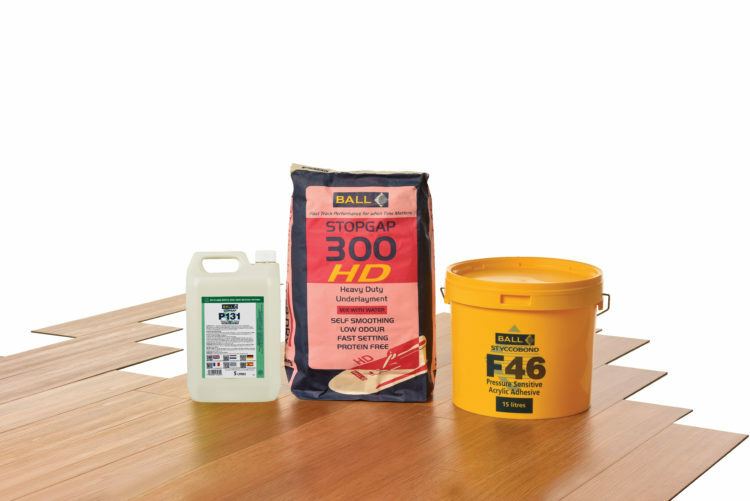 In order to promote adhesion between the subfloor and any subsequently applied levelling compound, as well as inhibiting the unacceptably rapid drying of the levelling compound, F. Ball recommends firstly priming the subfloor. Stopgap P131 is a general purpose primer for absorbent and non-absorbent surfaces. New Stopgap P141 has recently been introduced and is a fast-drying acrylic primer that has been specially formulated to promote adhesion between Stopgap levelling compounds and non-absorbent subfloors. It contains recycled uPVC pulver, which creates a hard, textured surface to enhance bond performance and makes it better able to withstand the increased stress that thicker levelling compounds experience when drying. Stopgap P141 dries in as little as 15 minutes and is pigmented yellow to aid coverage uniformity. The excellent self-levelling properties and heavy duty performance of F. Ball’s Stopgap 300 HD floor levelling compound produces the perfect base ready for the installation of LVTs. Stopgap 300 HD is a water mix compound, which offers fast-drying properties, and can be used for preparing a wide range of absorbent and non-absorbent surfaces. Its high compressive strength makes it ideal for where designer flooring will be subject to heavy loads or high foot traffic, and its protein-free formulation means it is suitable for use in biologically sensitive areas. Pressure sensitive adhesives are ideal for the installation of LVTs as they prevent tiles and planks from moving when positioning. F. Ball recommends Styccobond F46; a solvent-free, pressure sensitive acrylic adhesive that dries to a permanent tack. It is used for securing vinyl tiles and planks to Stopgap levelling compounds, concrete and sand/cement screeds, plywood, flooring grade chipboard and hardboard. The extended open time offered by Styccobond F46 reduces the risk of late placement, making it ideal for installing more complex designs and patterns. It can also be rolled following trowel application to reduce the incidence of trowel serrations shadowing through thin vinyl flooring and is designed to give strong initial tack and high bond strength, which increases as it is trafficked. It’s always advisable to check the compatibility of particular floorcoverings and adhesives. To do this, flooring contractors can consult the floorcovering manufacturer’s instructions. Additionally, F. Ball produces a recommended adhesives guide (RAG) annually, which lists adhesives recommended for use with floorcoverings produced by over 200 manufacturers. The guide is available as a free app or a printed booklet and an interactive version.